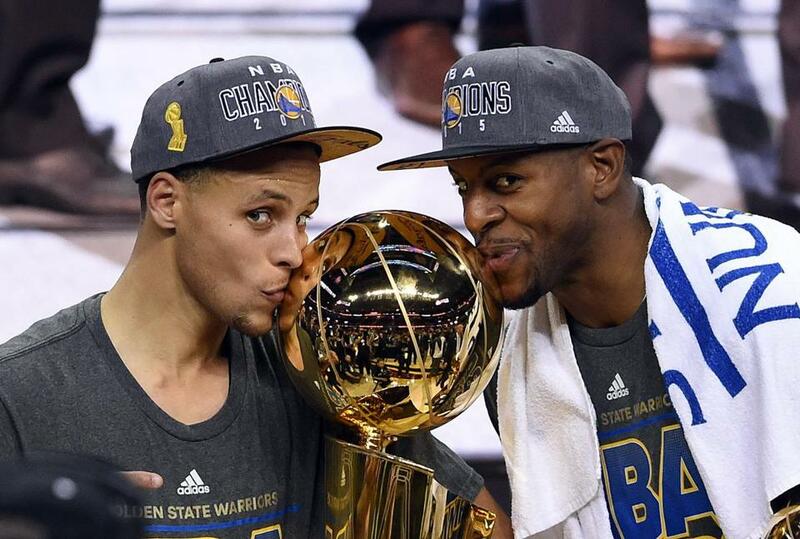 Stephen Curry and Andre Iguodala celebrate with the Larry O&apos;Brien NBA Championship Trophy. 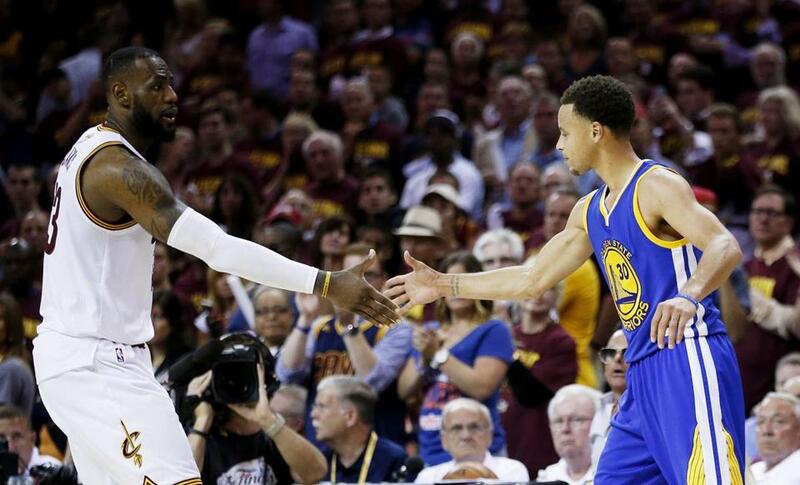 CLEVELAND — The Warriors played Tuesday as if they didn’t want to go home for a Game 7. Instead they longed to return to Oakland for a parade to celebrate the end of a 40-year drought. The physicality and brilliance of LeBron James and a raucous Cavaliers crowd at Quicken Loans Arena paled in comparison to the Warriors depth and offensive execution in Game 6 of the NBA Finals. A franchise that has been an NBA afterthought since its lone title in 1975 returned to glory behind a pair of baby-faced long-range shooters and a grizzled veteran who shined on his biggest stage. Andre Iguodala, discarded three years ago by Philadelphia and a reserve for the entire regular season, continued his NBA Finals mastery while Stephen Curry hit some timely 3-pointers as the Warriors defeated the Cleveland Cavaliers, 105-97. The Warriors won the final three games of the series after falling behind two games to one, imposing their up-tempo, perimeter shooting style will on the shorthanded Cavaliers. Draymond Green, a potential Celtics free-agent target, finished with a triple double – 16 points, 11 rebounds and 10 assists – while Iguodala led the Warriors with 25 points, including three 3-pointers. Iguodala was named series MVP, averaging 16.3 points, 5.8 rebounds and 4 assists and most importantly providing resistance for James, who attempted 193 shots in the series. The 76ers dealt Iguodala, a one-time franchise cornerstone, to Denver three years ago, and the Warriors signed the swingman to a four-year, $48 million deal. He became a reserve this season, not starting until Game 4 of the Finals. James, who was dominant for most of the series, just appeared exhausted. Some expected a mammoth game to keep the series alive, and James scored 32 points on 13-for-33 shooting with 18 rebounds and 9 assists. While those numbers were close to his previous performances, he seemed to lack energy after practically carrying the Cavaliers to this point – without All-Stars Kyrie Irving and Kevin Love. LeBron James (left) was making his fifth straight NBA Finals appearance. It was the second consecutive NBA Finals loss for James, who is now 2-4 in the Finals and his dream of bringing Cleveland its first major professional sports title until 1964 will have to wait at least another year. Cleveland’s last lead was 47-45 after a Tristan Thompson layup early in the third quarter. The Warriors responded with a game-controlling 9-0 run and the Cavaliers were left scrambling to stay close. What became evident as the series progressed was that James would never receive enough consistent help from his teammates. Timofey Mozgov added 17 points with 12 rebounds and 4 blocked shots and Thompson added 15 and 13 rebounds, but the players the Cavaliers needed the most to produce offensively never got untracked offensively. Game 3 hero Matthew Dellavedova, tabbed as a Curry stopper earlier in the series, was exposed in the final three games. He finished 15-for-53 shooting in the series (28.3 percent) and scored 1 point in Game 6. Meanwhile, Curry, the regular-season MVP who struggled in the first two-plus games of the series, was pivotal in the comeback from a 2-1 deficit. His 3-point shooting opened up the floor and allowed the Warriors to play the type of basketball that helped them win 67 regular season games. Curry was considered merely an undersized long-range shooter coming out of Davidson College six years ago, but he has emerged as the face of the rejuvenated franchise. The Warriors’ depth was simply too much in what was a surprisingly competitive series. But the key to Golden State’s resurgence appeared to be the fourth quarter of Game 3 when it rallied to cut a 20-point deficit to 1 and Curry got untracked, despite the defeat. After winning 51 games last season but losing in the first round of the Western Conference playoffs to the Los Angeles Clippers, the Warriors removed Mark Jackson as coach and hired Steve Kerr, who became the first first-year coach to win a title in 33 years. The Cavaliers tried valiantly to send it to a Game 7, making one final spurt to cut the deficit to 101-97 after a contested 3-pointer by J.R. Smith with 33.2 seconds left, but Curry responded with two free throws and it was apropos that Iguodala would clinch the title with two more free throws, ending a 40-year drought. Cleveland just looked confused and erratic offensively, committing 19 turnovers, resulting in 25 Golden State points. The Cavaliers, with their shorthanded lineup and six grinding games, were simply pooped. In one sequence James allowed the smaller Green to score on an easy post-up, providing little physical resistance. After the basket, he looked to his teammates as to why they didn’t help. That was the theme of the series. 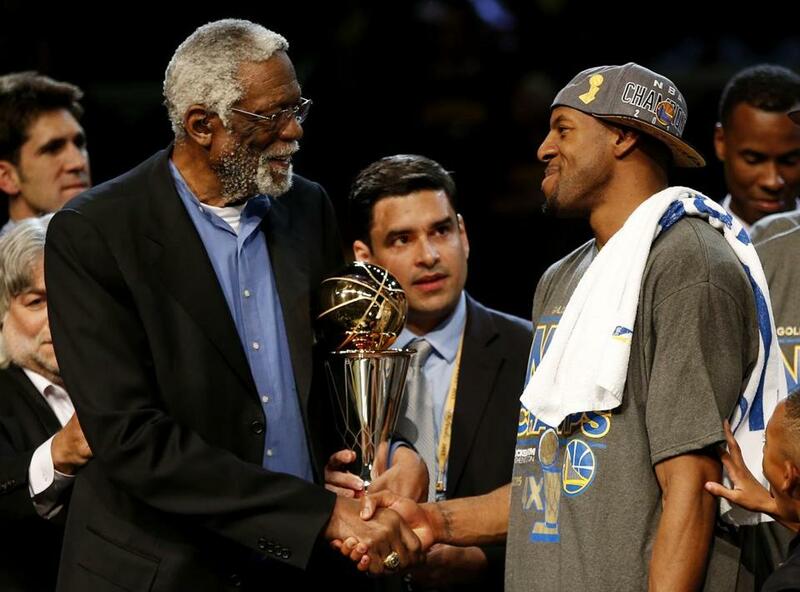 Bill Russell (left) presented the MVP trophy to Andre Iguodala.